Almonds are perhaps the best source of nutrients that are beneficial to the human body. It comes packed with minerals, vitamins, anti-oxidants, phytonutrients, fats, enzymes and calories. Considering this power packed source of nutrients as a ‘nut’ is not entirely correct. In fact it is the seed of the almond fruit and its nutrient content is aimed at propagating new life in the form of a whole new fresh almond tree. This nutritious source of essential ingredients has been around for centuries and has proved its worth in improving skin health in humans. But what needs to be understood is the simple fact that being a ‘seed’ with all its inherent composition, the primary function of almonds is towards propagating life and providing a safe cover to all the necessary ingredients it contains. And this protective nature of almonds can be demonstrated by the presence of unwanted fats, anti-nutrients and naturally occurring plant toxins. This is the reason why individuals afflicted with acne have reported fresh acne outbreaks after consuming almonds. For the seed this is purely a defensive mechanism but for humans this leads to adverse side effects in the form of increased acne development. As individuals vary in various respects and so does the effect the consumption of any form of nuts. Many have adapted and tolerated the negative nutrients present in these nuts and are able to consume them but there are still more who just cannot consume them. This variance is so large that for some people, almonds are a great source for maintaining a healthy skin tone while for some people afflicted with acne, almonds are the last thing they would consider for getting rid of acne. This diverse attribute of almonds is a reality. The following write up looks at the why this is so. The following looks at what makes almonds one of the most preferred sources of nutrients to get rid of acne. Vitamin E – This is perhaps the single most effective vitamin for treating acne and it is found in abundance in almonds. Consuming just 50 grams of almonds daily has the capacity to get rid of acne for good. And this extremely beneficial effect of almond can be attributed to the high amount of vitamin E it contains. Mere 50 grams of raw almonds delivers 13.1mg of vitamin E which adds up to 65% of the RDA or recommended daily allowance. The skin on the face secretes oil or sebum and is a natural process of the body. But the problem arises when this blocks the pores in the skin. This leads to acne and this outbreak of acne can either be severe or mild depending on the levels of vitamin E. Low vitamin E levels coupled with an oily skin blocks pores more than oily skin with high levels of vitamin E. In the former scenario, squalene is formed as a result of oxidation and makes up for 12% of the sebum. Now when this is acted on by sunlight, chlorine or chemicals, it transforms into squalene peroxide which further aggravates the condition by stimulating the secretion of sebum at the pores and also by increasing the levels of a protein which clumps together dead skin cells, called keratin. This process can be reversed by vitamin E and when present in high levels, the sebum uses this to off-set the oxidation process. Vitamin E also helps in reducing inflammation and irritation by taking on the role of an anti-oxidation. A study found that patients afflicted with acne had 9% less vitamin E compared to others. Consuming almonds is a convenient and tasty way of stocking up on the all essential vitamin E to get rid of acne. Another effective anti-acne food is hazelnut which contains vitamin E to the tune of 37% of RDA per 50 grams of serving. Cashew nuts and pecans contain 2% and 3% respectively. Scientific studies have confirmed the elevation of vitamin E in blood considerably. In a study conducted to ascertain the anti-oxidative levels in male volunteers who smoked, it was found that there was an increase of 10% in alpha tocopherol a natural vitamin E after they were given 84 grams of almonds per day. In another study, trained endurance athletes were given 50 grams of almonds. At the end of ten weeks their vitamin E levels were far superior to the control group. In yet another study, two groups whose vitamin E levels were identical at the start of the study were taken. 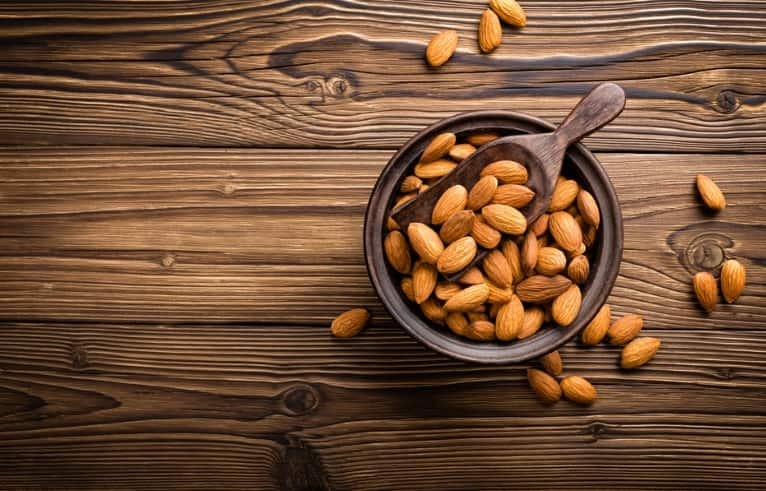 One group was given 50 grams of almonds daily and at the end of four weeks, their alpha tocopherol levels were higher compared to the group not given any almonds. Almonds are extremely beneficial for acne removal and consuming fifty almonds everyday could work wonders in getting rid of them. Anti-oxidants – Almonds contain host of anti-oxidants and these get rid of acne by fighting free radicals and protecting the sebum from bacterial activity. In fact almonds fare very well on the ORAC scale which measures the anti-oxidative property of foods. It has an ORAC score of 4454 per 100 grams which is higher than strawberries (4302) but somewhat lower than blueberries (4669). The skin of almonds is extremely rich in flavonoid anti-oxidants and ployphenols besides quercetin, kaempferol, isorhamnetina and catechin. Nine other anti-oxidants were identified in a study which included vanillic acid and naringenin. The study concluded that almost all these anti-oxidants effectively prevented free radical activity and in particular 6 and 7 which showed extremely powerful activity, the remaining had strong activity whereas anti-oxidant number 4 exhibited weak activity. Another great source of anti-oxidants in almonds is epicatechin. It has 2.6mg/100 grams and is more than blackberries (0.15mg), pomegranate (0.16mg), strawberries (0.06mg) and green grapes (0.02mg) but scores less than hazelnut which has 2.9mg/100 grams. Among fruits only banana is close with 2.14mg/100 grams. In a study to ascertain the protective property of epicatechin on human skin to UV radiation, it was found that it had the potential to protect against the harmful effects of sunlight on human skin. Almonds exhibit complex and diversified effects on the human body. A study found that the levels of glutathione increased by 16% along with an increase of 35% in the production of superoxide dismutase in male smokers who consumed almonds. The human body produces two primary anti-oxidants namely, GSH and SOD. It may be surmised that increased levels of glutathione co-factor magnesium provided by almonds could be responsible for this or it could be a yet to be identified compound. Moreover, the levels of two markers used to identify free radical activity, called 8-hydroxy-deoxyguanosine and malondialdehyde dropped by 28% and 34% respectively. In an interesting study, it was found that only 3.6% of all anti-oxidative activity was brought about by quercetin, catechin, epicatechin, kaempferol and isorhamnetin. This gave rise to the speculation that there was still an unidentified compound responsible for the powerful anti-oxidative property exhibited by almonds. In yet another study, it was found that the oxidative stress, which is the balance between free radicals and anti-oxidants in the human body, was significantly brought by 23% to 24 % after consuming 84 grams of almonds for a period of four weeks. The above goes to prove that almonds are an excellent source of anti-oxidants that help remove acne. There have been instances where people have reported an increase in acne outbreak after consuming almonds despite it having a rich content of vitamin E and full of anti-oxidants. Fats – All nuts have fat and this is utilized as a form of energy for the seed to grow into trees. The fat content in almonds is 49.4% along with protein (21.2%) and carbohydrates (3.9%). The small levels of carbohydrates in almonds pose no risk of over dosing but it is how the fat content in it breaks down is what causes the problems. Almonds have 10% of its fat content in the form of saturated fats, monounsaturated fats make up 70% and 20% make up polyunsaturated fats. Almost all of the polyunsaturated fats (99.99%) are omega 6 also known as linoleic acid and a miniscule amount is omega 3 or linolenic acid. Consuming too much of omega 6 fats leads to the immune system becoming overactive resulting in the outbreak of pimples and this situation can further be aggravated by consuming too many almonds. The important thing to keep in mind is the balance between omega 6 and omega 3. A balanced ratio is between the two is 3:1 or 1:1. But by consuming almonds this ratio goes haywire to 2000:1. Another important factor is the diet. Eating too much fries, junk food or using soybean oil as a cooking medium for meats causes the levels of omega 6 fatty acids to go out of control. Added to this condition is the consumption of almonds which further aggravates the already out of control omega 6 fatty acid levels and the answer is self explanatory. Toxins – Plant toxins are defensive mechanisms for their survival and oxalates or oxalic acids are examples of just one among many. Oxalates prevent the absorption of minerals like magnesium by binding with them and it is because of this that kidney stones are precipitated in sensitive people by consuming rhubarb and spinach. In an acne compromised condition, oxalates could compound the problem by causing inflammation. And this is especially true for those who cannot digest oxalates because the oxalates pass into the blood stream and bind onto calcium molecules. This leads to formation of crystals which aggravate the condition causing inflammation. Besides inflammation, rashes on the skin are classic oxalate sensitivity symptoms. By virtue of oxalates being present in the blood stream, they can also bind to other minerals in the body and cause a depletion of acne nutrition. The levels of oxalates in all foods are negligible but with almonds it is different. It is the fifth commercial food with high levels of oxalates with levels of 133mg per 100 grams and is more than any other edible nut. Only spinach has oxalate levels (755mg) higher than almonds. The oxalate content in plants is both soluble and insoluble. A study found that almonds contained soluble oxalates and the absorption of this form of oxalate was significantly higher compared to black beans. Consuming raw almonds has its benefits but having a compromised digestive system will only trigger an outburst of problems related to skin. But this not the case with kale or spinach this is because boiling them before consumption destroys much of the toxins. The nutritional benefits of almonds for treating acne offer both advantages and disadvantages. Almonds also contain 1280mg of another organic acid which binds to minerals called phytic acid. This acid which is a concentrated form of lectins is a plant defensive toxin and can damage the lining of the intestines further aggravating the digestive process. Almonds also contain enzymes which prevents the digestion of acne helpful nutrients. It is worth mentioning that almonds run the risk of being contaminated with myotoxins especially those with low quality. These low quality almonds have been tested for aflatoxins, a specific type of myotoxin produced by aspergillus flavus and aspergillus parasiticus. The moulds of these myotoxins polluted almond plants. In healthy individuals, this contamination caused inflammation but for acne afflicted people the risk is more. The above write up very clearly brings out the fact that almonds can never be the ideal nutrition for acne removal or prevention. They are rich and full of nutrients that in some acne afflicted individuals, they can easily get rid of acne and improve the skin tone while at the same time for others they turn out to be a bane. Consuming just a handful daily could bring about contrasting results. The high levels of vitamin E and the host of anti-oxidants present in almonds are generally not affected by the phytic acid and oxalates. All these two bring about is the prevention of the absorption minerals into the blood stream. But the more important point to take note of is tackling omega 6 fatty acid and the toxins from the plant itself. For those who have experienced acne outbreaks after consuming nuts that have the same anti-nutrient profile as almonds, it can be safely surmised that these individuals are already sticking to a diet that is acne friendly. This means that their digestive system along with their skin health has already been strengthened. This would allow these previously acne afflicted individuals to thoroughly enjoy consuming almonds and reap the many benefits that this amazing nut offers, especially the intake of vitamin E.
Diet plays a major role in preventing and removing acne. But following a diet that is counterproductive to acne nutrition, and then with the consumption of almonds would lead to greater skin problems. But on the other hand if the acne is due to deficiency of vitamin E, then the consumption almonds would come as a boon. Almonds have a lot to offer in terms of its vitamin E content and anti-oxidative property in preventing and getting rid of acne. Consuming these highly nutritious nuts and being aware of the potential side effects is the only way forward.